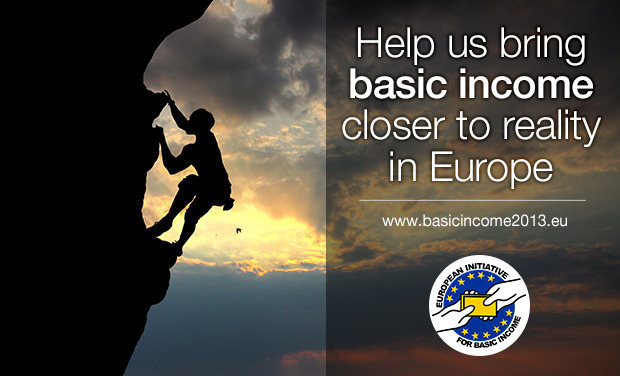 Help us bring basic income closer to reality in Europe! Help us finance the collection of 875.000 signatures FAST so we can make basic income the hottest political topic in Europe. European Citizens' Initiative for Unconditional Basic Income (www.basicincome2013.eu) proposes a new form of total social security for all citizens. It aims to eradicate poverty, protect people from the consequences of un(der)employment and recognise the essential labour which happens outside the market. Our goal is to collect 1 million signatures by January 2014 to force the European Commission to do research into the policy and organise an official hearing about basic income in the European Parliament. 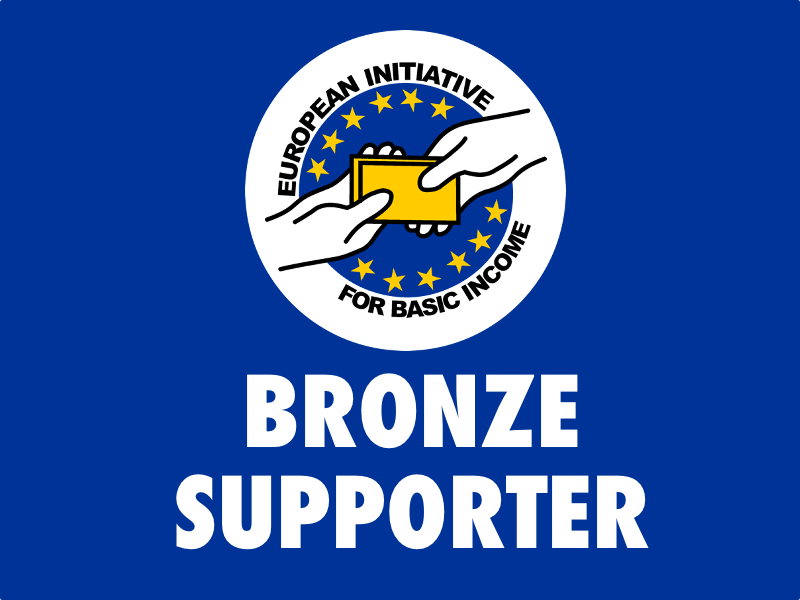 We’re now calling on all basic income supporters and the 125,000 people who have already signed our initiative here: http://sign.basicincome2013.eu to donate and help us finance the collection of the rest of the 875,000 signatures needed. It’s important that we do it now - while the whole of Europe is excited about basic income. With enough contributions we can reach millions rapidly and make basic income a political topic which can’t be ignored anymore. Please click the button “Back This Project” in the upper right corner of this page and donate now. This was as hard as it sounds. 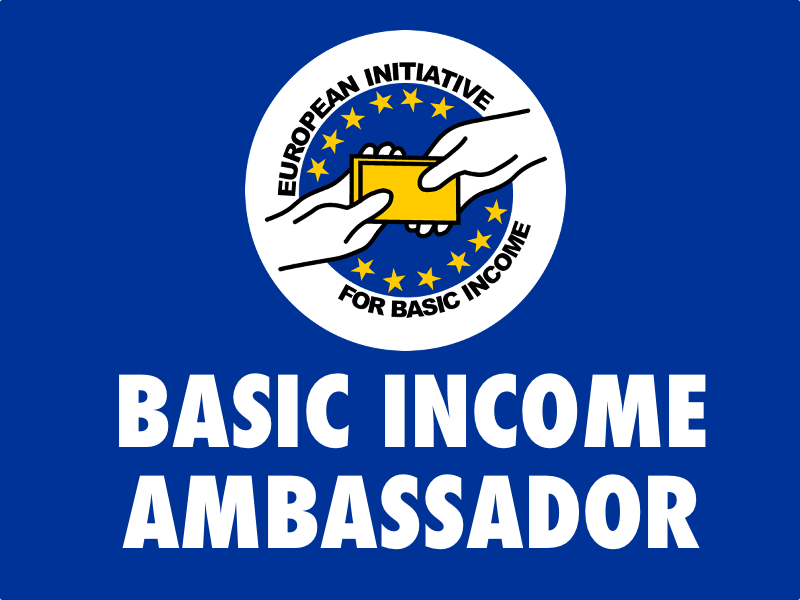 In many European countries, the word “basic income” was not even recognised by search engines. Many of us had thought it was a good idea on our own but didn’t know many others who had looked into it. And there the initiative organisers were trying to find like-minded people who would help us collect a million signatures. Luckily, we’re proud to say that almost all European countries now have national basic income groups, websites, and people in social media who are promoting the idea. During the last eight months there have been more articles about basic income in both mass and alternative media than ever before. We went to demonstrations. We organized talks and gave interviews for the mass media. We have made wonderful friends across Europe and successfully mobilized passionate people who will one day help make basic income a reality. In September 2013 Croatia happened. This newest member state of the European Union started promoting their freshly built basic income website and their Facebook page. Fast forward to October the 15th: to everyone’s surprise, Croatia, as the last country to enter the race for signatures, became the first country to collect their minimum quota of signatures. They achieved it in only 45 days, sitting at their desks, using nothing but the power of the Internet, their website, their Facebook page and the enormous attention of the media. Which brings us back to the power of the Internet. Inspired by Croatia, other countries started using this simple tactics: use Facebook to spread the central website’s message about basic income, occasionally pay for the most successful Facebook posts to reach a huge number of people overnight and watch the signatures pour in. 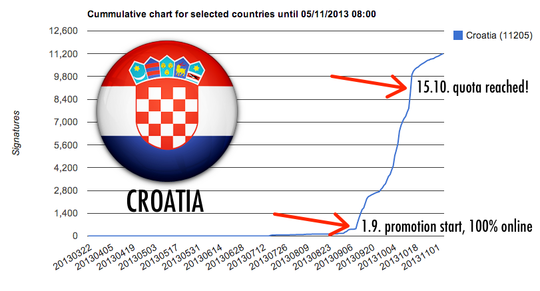 Croatia spent only 89 euros on paid promotion. The rest of the campaign was 100% purely organic internet wizardry, amplified by the media attention. 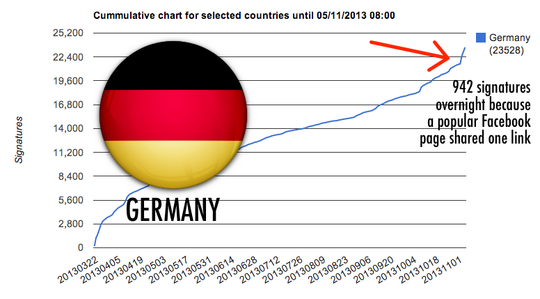 The result: 9000+ signatures and quota reached in only 45 days. 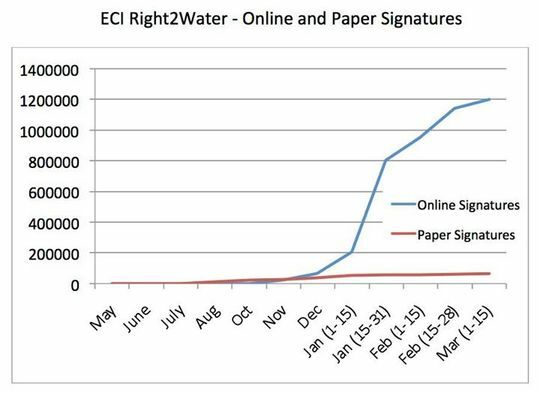 Take a look again: this ECI collected 1.2 million signatures, and most of them were collected online during the last three months of the campaign. This is exactly where our initiative is right now. People think that "not everybody uses Facebook", but a 192 million European Union citizens in fact do (source: Internet World Stats). Facebook is a tremendous tool for reaching all of them almost overnight, informing them about what basic income and our ongoing European citizens’ initiative are, and presenting them with a button to click to sign the initiative online. You already saw how Croatia reached its quota in only 45 days. But why wait so long? Well, that’s how long it takes if you have enough time to do it for free, using the so-called organic features of Facebook. With more funds at their disposal, Croatia would have reached its quota in probably half that time. 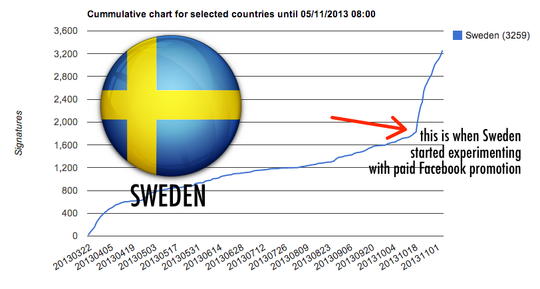 You’ve also seen how Sweden, Germany and Portugal used Facebook to increase the number of signatures. Everything points in one, single direction: it is possible to collect a massive number of signatures in a very short period of time. We’re talking about a couple of weeks. Probably even days. So, it's not like basic income lacks public support: on the contrary! Our biggest challenge now is reaching a million supporters in time with almost zero funding. We’ve built an amazing international community of organisers who are becoming a future force for basic income. You should witness the passion, excitement and frustrations of our activists when we’re collaborating online, watching the signature graphs go up and down daily, brainstorming all the possible ways to get more signatures than the day before, debating about the various approaches to basic income implementation. Our European Citizens’ Initiative for Unconditional Basic Income is probably the largest active basic income movement in the world right now. Thousands are working on raising awareness of their friends, family and complete strangers on the streets of our cities. Our potential to quickly convince people about the benefits of basic income is immense and we need to seize this opportunity now, while Europe is still buzzing with activity. A person is never able to shrink back into their former mental boundaries once they hear about the possibilities opened up by basic income. That’s an opportunity right there, to move quickly, and bring the day closer when basic income is implemented in the first European country. The first country to implement basic income will create a political and social ripple effect throughout the world - mark our words! Can you imagine what the world would look like if all seven billion people could live like decent human beings without the stress and worry about potential homelessness and hunger? Donations for the European basic income movement begin at only 1 EUR. Scroll up this page and click "Back this project" to donate now. You can donate no matter where in the world you live. An ECI is a way for EU citizens to have their voice heard by the lawmakers. European Citizens’ Initiatives (ECI) are aimed at increasing direct democracy in the EU. The initiative enables one million citizens to call directly on the European Commission to propose a legal act in an area where the Member States have conferred powers onto the EU level. If our ECI is accepted, it will make the lawmakers look at this policy, debate it and carry out pilot studies. Where studies into unconditional basic income have been done in Canada, India, Namibia and other places, it has proved highly effective in improving the education, health and nutrition of the poorest people, while raising the level of economic activity overall. 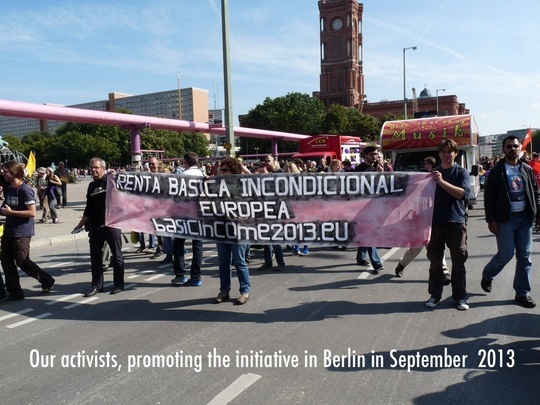 We’re activists, academics, journalists, authors, European basic income veterans gathered around www.basicincome2013.eu. Learn more about us. Some of us have only recently come to know about basic income but immediately felt its justice. We have official support of BIEN (the Basic Income Earth Network), the world’s oldest and the most important basic income organization. We need a million European signatures for basic income, but it has proved too challenging with almost zero funding. That’s why we’re asking all basic income supporters to help by donating a small sum of money which we will use to finance the online and offline promotion of the initiative. It’s important that we succeed: with this we can make basic income a hot political topic and pressure our lawmakers in Europe to take the eradication of poverty seriously. We have time until 14 January 2014 to collect the last 875,000 signatures. Thank you and please donate now, any amount between 1 - 499 euro will be accepted. #1 We will pay for targeted online promotion campaigns. We want to make sure that all who agree with UBI (or some form of it) as a potential alternative for social security actually sign our initiative. #2 We will produce leaflets about basic income and other campaign materials for the Initiative. An allocation will be given to each country according to their needs. #3 We will enable the organisers to attend meetings for the initiative, especially the ones who have not been able to travel to Europe-wide meetings so far. These meetings have proved very useful and inspiring. #4 We will cover organisational costs for a conference about basic income at the EU Parliament. We already have the support of some members of the European parliament (MEPs) for this. Our crowdfunding campaign runs for only 14 days because there’s not much time left. If we reach €25,000 euros, we will finance audiovisual projects -- for instance the production of a dubbed versions of the Swiss movie Basic Income - A Cultural Impulse in several languages. The Swiss basic income movement has proven to be a huge inspiration to European citizens and we would love to use their example to further spread the basic income idea. Any monies which exceed this figure, or left over after the initiative for basic income’s deadline of 14 January is reached, will be used to further other European projects promoting basic income. 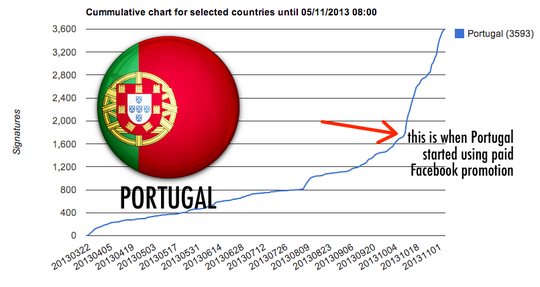 We will publicly post proof of every euro we spend, once the initiative is completed in January 2014. 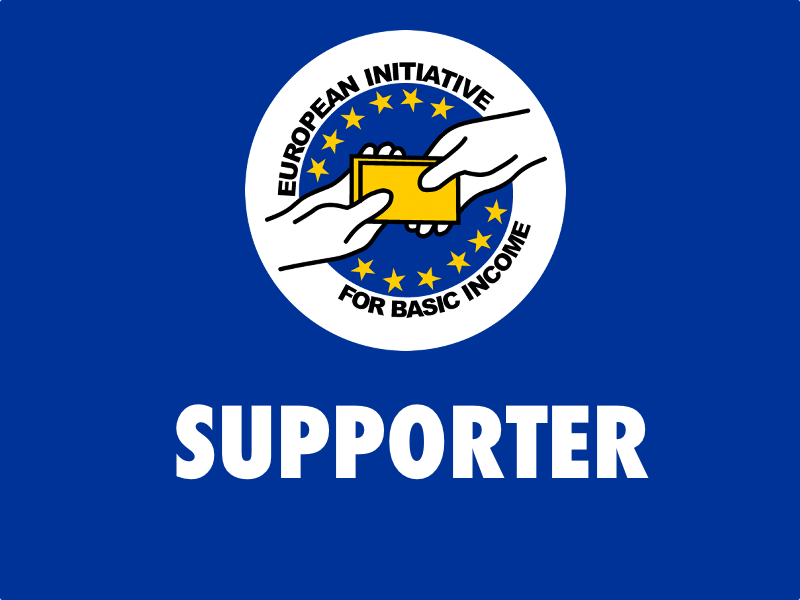 Our sincere thank you + "I supported the basic income movement in Europe" generic BANNER, emailed to you and customized for your Facebook, Twitter, and website. 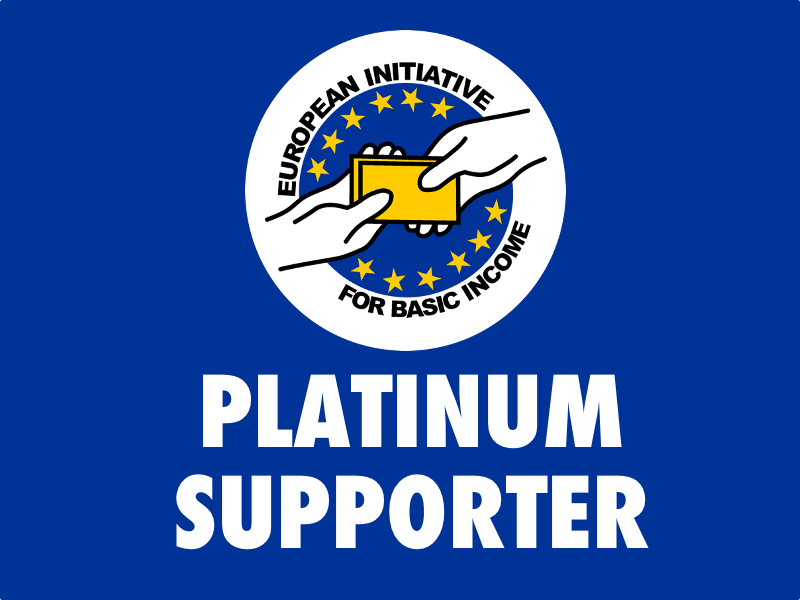 PREVIOUS REWARDS + a PUBLIC MENTION in a post from our @basicincomeEU Twitter account and our ECI.BasicIncome Facebook page, thanking you personally. If you just want to donate and don't want any spotlight in our social media: don't worry. Before publishing social media shout-outs, we will contact all supporters, you'll be able to let us know if you don't want to be mentioned. PREVIOUS REWARDS + a set of printed paper STICKERS with your desired slogan, mailed out to your physical address. PREVIOUS REWARDS + a 5-pack of 32mm BUTTONS with the ECI-UBI logo on it + inclusion of your profile picture on a "thank you" FACEBOOK COVER on facebook.com/ECI.BasicIncome, for three months, if desired. PREVIOUS REWARDS + a premium, 100% cotton T-SHIRT in your size, with the ECI-UBI logo on it + a personalized POSTCARD mailed out to your physical address, with a thank you message signed by the organizers of the Initiative + DIGITAL E-BOOK "The Precariat: The New Dangerous Class", personally e-mailed to you by the author, DR. GUY STANDING who is also a well-known basic income advocate. PREVIOUS REWARDS + personalized DEDICATION WEB PAGE on our website www.basicincome2013.eu with your name, your image, your links and a custom text you want (if such publication is desired) + the PRINTED BOOK "The Precariat: The New Dangerous Class", personally signed by the author, dr. GUY STANDING who is also a well-known basic income advocate.